Is Dhanush's Powerpaandi a remake of Wild Hogs? All of us woke up to the striking announcement of Dhanush making his directorial debut with Powerpaandi. Just like the title of the film, even the casting looks quite interesting with actor Rajkiran playing the lead. The first look poster showed us that the film could possibly be talking about few age-old motorcyclists who might go on a road trip. In the poster, beside Rajkiran you will find a black bullet with the number plate TAU 0010. TAU is an old series automobile registration number used for Madurai zone. So there is a possibility that Rajkiran might hail from Madurai according to the script. We also find an uncanny resemblance to a famous Hollywood film Wild Hogs from the poster. 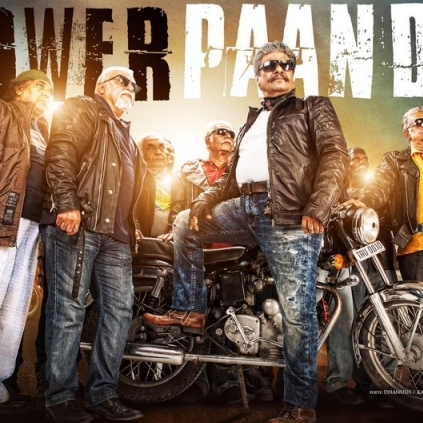 There are speculations saying that Powerpaandi is a remake of Wild Hogs just because the first look has some resemblance. Mind you! Posters could well be deceiving and it is not correct to judge a film’s story just based on its poster. Let's wait and see! What happened to Aaranya Kaandam director? People looking for online information on Dhanush, Powerpaandi will find this news story useful.